The small Nottinghamshire village of Carburton lies several miles south-east of Worksop. The Duke of Portland was the main landowner and manorial lord of the parish. 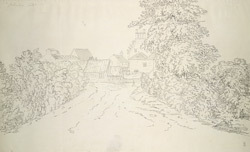 The village contained a small Norman chapel, the belfry and roof of which can just be seen in this drawing. This is St Giles' church which consisted of a nave, chancel, porch and south arcade. The windows have Y-shaped tracery on them.